"This salad is so easy to make and every time I take it to a potluck I get asked for the recipe!" Wash grapes in a colander under running water, and remove all stems. Place in a large bowl. In a separate bowl, stir together the cream cheese and marshmallow creme until smooth and creamy. Pour the mixture over the grapes. Using a rubber spatula or large serving spoon, fold the mixture into the grapes until well coated. Fold in the almonds. This salad may be served immediately, or covered and refrigerated for 1 hour to set slightly, and to allow flavors to blend. Love it! We use chopped peanuts instead and people have said it tastes like a caramel apple! 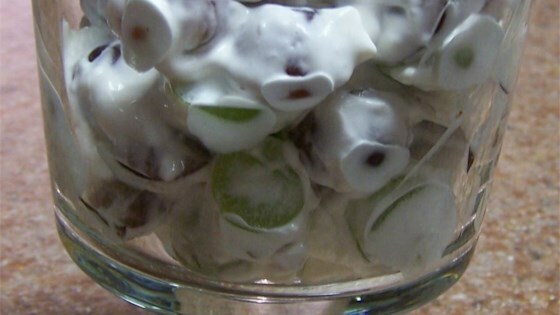 This Recipe is now a favorite sweet fruit side dish and Dessert for my family!! Sooo easy and soooo yummy! Nice, different. I took it to a brunch and was asked for the recipe. I think next time I will try it with peanuts instead (or without nuts for my allergic daughter). This recipe is so simple to make, yet it's very good. It is refreshing on a hot summer day.